Jiraiya, pictured in front. 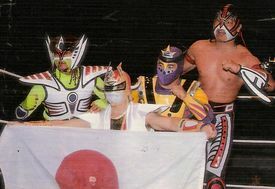 Jiraiya's gimmick is based on the 1988 "Sekai Ninja-Sen Jiraiya" tokusatsu TV series in Japan by Toei. In the early-mid 90's, he competed in CMLL, Promo Azteca and AAA, in additional to occasional matches in Japanese independent promotions like Kageki and VAMOS. He has also competed in mixed martial arts fights in Koki Kitahara's CAPTURE group. While in Japan, he with Goku, Lyguila, Shiiba and Tobkiage. This page was last edited on 6 July 2018, at 13:43.